Have fun creating a special achievement that you want to be reached. Once the achievement has been accomplished, award the student that came in second place with the 2nd Place Ribbon. The 2nd Place Ribbon is a red ribbon that is decorated and has 2nd place displayed on the ribbon. The 2nd Place Ribbon is finished off with a gold tassel. 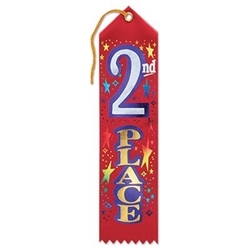 The 2nd Place Ribbon is printed on only one (1) side and comes with only one (1) ribbon. There is a white card on the back of the ribbon that has lines provided to write a person's name. We also have the 1st Place and 3rd Place Ribbon. When shipping extra ribbons, should at least be put into some sort of envelope. My extra ribbons arrived bent/creased from just being loose in box.